Concept: The White spruce / Wood goldenrod / Shaggy moss forest features prominent white spruce, variable shrub and herb development, and moderate to high bryophyte cover. Site conditions suggest this forest floods less frequently and/or for shorter durations than other flooded forest ecosystems in Nova Scotia. The ecosystem has some boreal affinity but differs from boreal floodplain forests by its array of temperate species (e.g. white ash, sugar maple, and plants such as sensitive fern and wood goldenrod). Vegetation: Canopy layers are heavily dominated by white spruce. Elm, white and yellow birch, white ash, sugar maple and balsam fir may be scattered with low cover or restricted to the understory. Black ash is an infrequent associate. Shrub cover is low to moderate depending on disturbance history, stand size and adjacent land use. 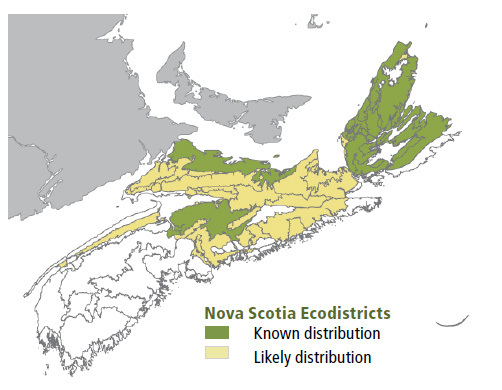 Compared to most other flooded forests of Nova Scotia, herbaceous development is relatively low, but more actively flooded, usually moister, and more northern stands support higher herb cover. Mean bryophyte cover is the highest of any flooded forest type. Shaggy moss is the only common species, but some stands support high levels of Atrichum moss. Environmental Setting: FP6 is mainly associated with fresh to fresh-moist, nutrient rich alluvium soils. 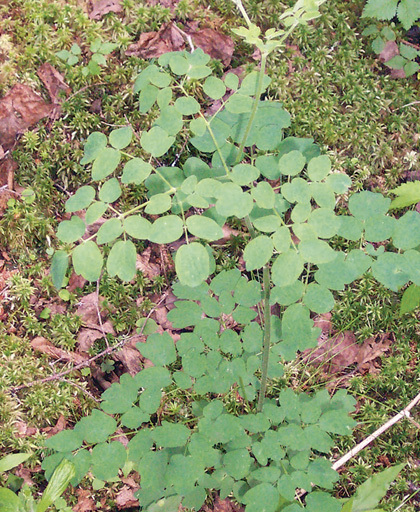 This Vegetation Type (VT) is most often found in Cape Breton, but can also occur in central and northern areas of Nova Scotia. Flood cycles are intermittent or of short duration. 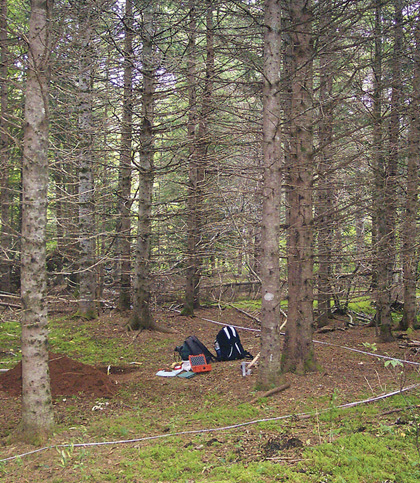 Soils are usually deep with low coarse fragment content and thin forest floor. FP6 is uncommon across northern and central New Brunswick, but absent from Prince Edward Island. Successional Dynamics: The White spruce / Wood goldenrod / Shaggy moss forest is an early to mid-successional ecosystem. Stands may succeed shrub and herb dominated vegetation, after floodplain formation, or after some level of human disturbance (usually agriculture). On most sites FP6 is expected to perpetuate or transition to FP4 (Balsam poplar – White spruce / Ostrich fern – Cow-parsnip). Stands on relatively inactive floodplains may eventually succeed to an upland forest type. Disturbance agents include flood events, insects and disease (especially spruce bark beetle) and harvesting. Ecological Features:This ecosystem displays a unique combination of upland and riparian features, and is the only floodplain forest dominated by an evergreen tree species. Infrequent and/or low duration floods promote favourable habitat conditions for ground bryophytes, fungi and some rare vascular plants. Stands may be important deer yards in cooler areas of Cape Breton and northern Nova Scotia. This ecosystem promotes riparian connectivity, reduces erosion of stream channels and banks, and augments levels of coarse woody debris and organic matter into adjacent aquatic habitats. Rare plant potential is low. Distinguishing Features: Sites for this softwood forest occupy a floodplain or river terrace setting that is flooded less frequently than other floodplain forest types. Mosses are common, including shaggy, stair-step and Schreber's. Evidence of recent flooding is not always present.